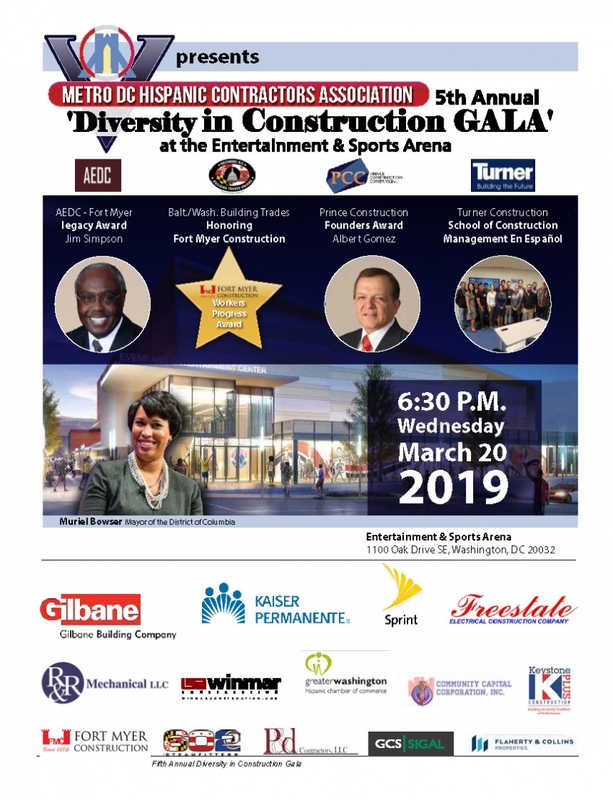 Metro DC Hispanic Contractors Association (HCA) presents its traditional, 'Diversity in Construction GALA' for the fifth straight year, this time at the newly built Entertainment & Sports Arena (E&SA) in Southeast DC on WEDNESDAY, MARCH 20th, 2019, at 6:30 pm. The premiere sponsor of the Diversity GALA is Gilbane Construction. Gilbane built the Arena and we hope to showcase the results of their efforts. Gilbane Vice President, Emre Ozcan, will present a special tribute to Ed Fisher from the office of the Deputy Mayor for Planning & Economic Development (DMPED) for his contributions to the St. Elizabeth's Campus project. The event celebrates the achievements of pioneers from the minority community in the local construction industry. 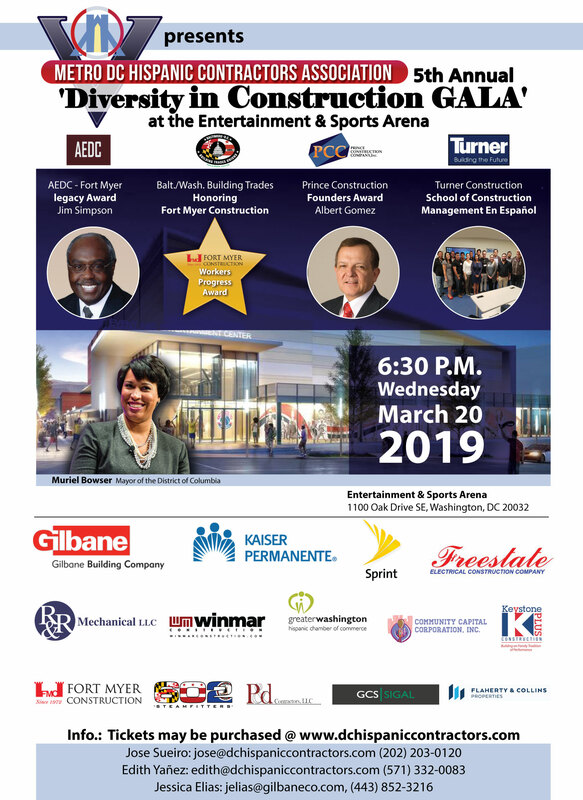 This year's ceremony recognizes: Alberto Gomez, Prince Construction; Fort Myer Construction for their work with the Balt./Wash Building Trades Unions, Jim Simpson, Continental Construction and HCA will recognize the groundbreaking efforts of its new Turner School of Construction Management 'en Español'. 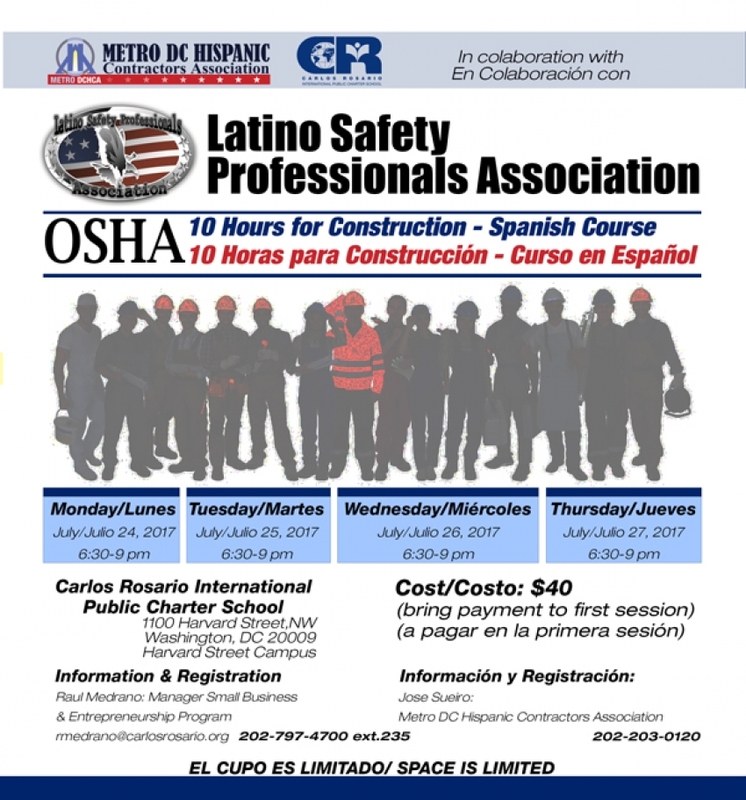 During the evening we'll introduce 10 entrepreneurs who just completed this year's; 'Turner School of Construction Management program - 'en Español', a unique and innovative series of construction workshops in Spanish developed in a partnership between Turner Construction, HCA and the Carlos Rosario School. This coming year, with the help of Sprint at its technical institute in Reston, Va., the TSCM 'en Español' series will become a nationwide, live streaming, inter-active program with links to at least 6 sites across the country. This year we institute the; 'Alberto Gomez Founder's Award' and will present the first one to Alberto, a long time community leader and President of Prince Construction. Alberto was on the Board of the original DC Convention Center and Chairman of the District's Minority Business Opportunity Commission. He has dedicated his life to expanding business opportunities and increasing economic development access for locally owned immigrant, minority & Hispanic businesses. Continental Construction Inc. is one of the most iconic construction firms in DC with 30 years of experience. Jim Simpson has nurtured dozens of DC based CBE firms to strength and prosperity. 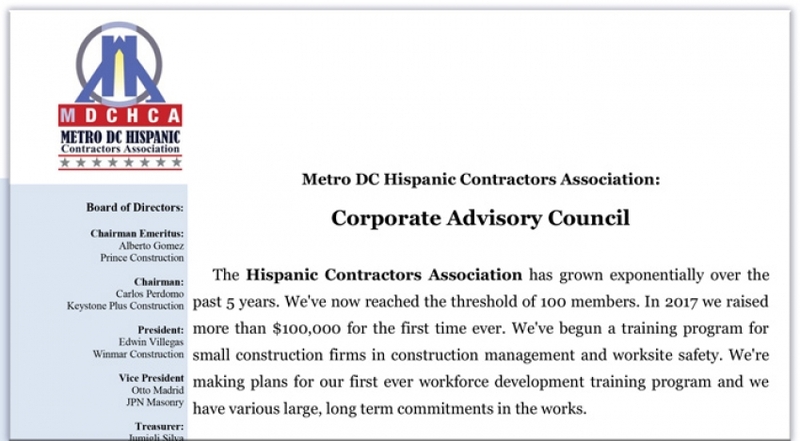 He is the former Chair of the National Association of Minority Contractors, DC Chapter. He will be introduced by Anacostia Economic Development Corporation CEO, Stan Jackson. AEDC has been our partner in all 5 'Diversity in Construction' events. The Balt./Wash. 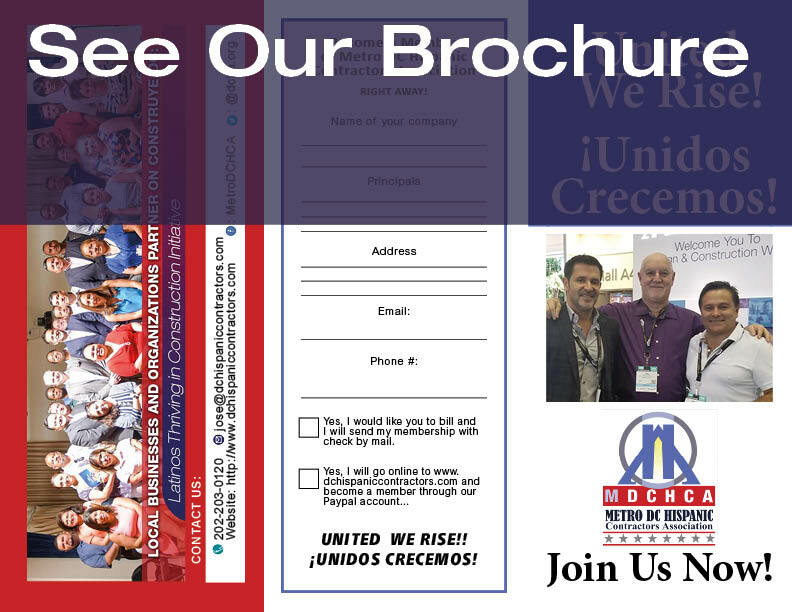 Building Trades Unions, our partners from the very beginning, are also a major sponsor of the March 20th, 2019 Diversity GALA. Construction union workers built the Arena and their leadership will be present March 20th to be recognized. The Building Trades Unions will honor Fort Myer, a union shop, that has a longstanding relationship, built over many years of trust, with labor unions. Hosts for the evening will be HCA Chairman of the Board, Carlos Perdomo, Keystone Plus Construction and HCA President, Edwin Villegas, Winmar Construction. HCA Treasurer, Tatiana Ahlborn, Absolute Builders and the organization's Treasurer, along w/Managing Director, Jose Sueiro, will also host the evening. This is one of the first, premiere, private events to be held at the E&SA. We expect 500 professionals from the construction sector, related industry professionals and regional government officials. Mayor Muriel Bowser has agreed to address to the group. Additional Silver Sponsors: Community Capital Corporation, Flaherty & Collins, Freestate Electrical Construction Company, GCS Sigal, Kaiser Permanente, R&R Mechanical LLC, Steamfitters Local 602 and Sprint. 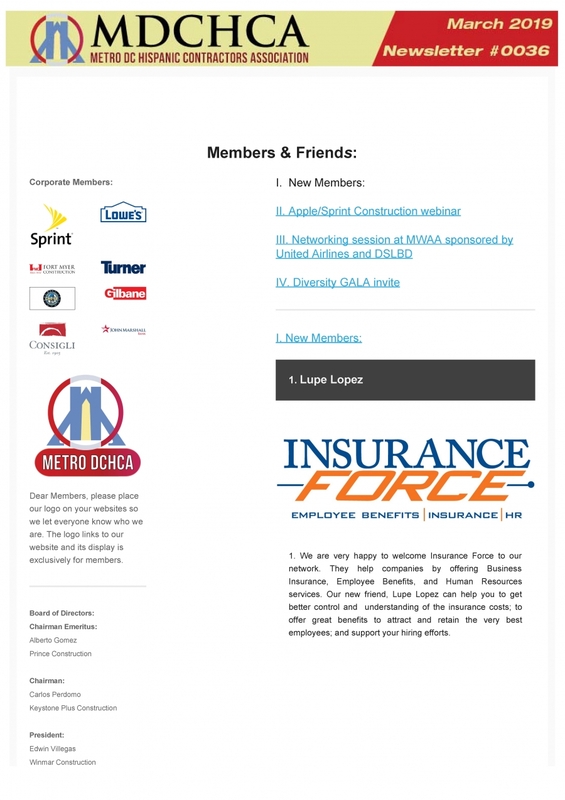 MISSION: DCHCA presents constructive membership benefits in the areas of training, consulting, business procurement, and advocacy to its membership. VISION: - Provide a platform for the Hispanic & Immigrant Contractor’s community to set forth their aims and ideals. 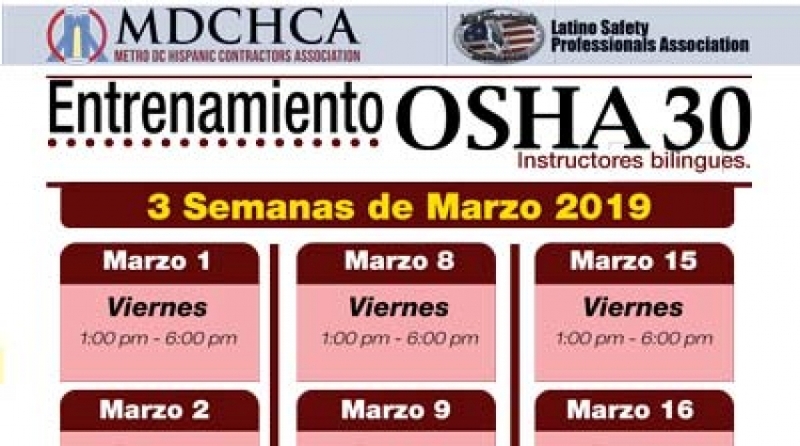 TRAINING: DCHCA offers numerous educational sessions, at minimum cost and on an ongoing basis. CONSULTING: Consulting for Construction Businesses. Services include: Guidelines for Start-ups. CONTRACTING OPPORTUNITIES: Offering information about actual and upcoming construction projects for members to participate in the bidding process. ADVOCACY: Works closely with private, public, government, and other nonprofit organizations in order to identify business opportunities and promote the Inclusion.